May 16 is Denise Levertov Day in Seattle. For a listing of related events, including a choral setting of Levertov’s poem “Making Peace,” visit St. John’s Parish. I’m waiting for the kettle to boil in Denise’s kitchen. It’s mid-November and raining. Out the window, the branches of her unruly pear are outlined against the gray sky. At three-thirty it’s already dusk. I look across neighboring roofs and down to Lake Washington where I can barely distinguish lake water from the black forest rising behind it. I pour boiling water into Denise’s serviceable yellow tea pot wide enough to hold four cups, swirl it around the sides, and dump it into the sink. I put three tablespoons of English Breakfast tea into the pot, refill it with water, and steep until it is black and strong. I set it on a tray next to a sugar bowl, pitcher of milk and a plate of cookies, and carry it all into the living room where Denise is sitting on the couch. 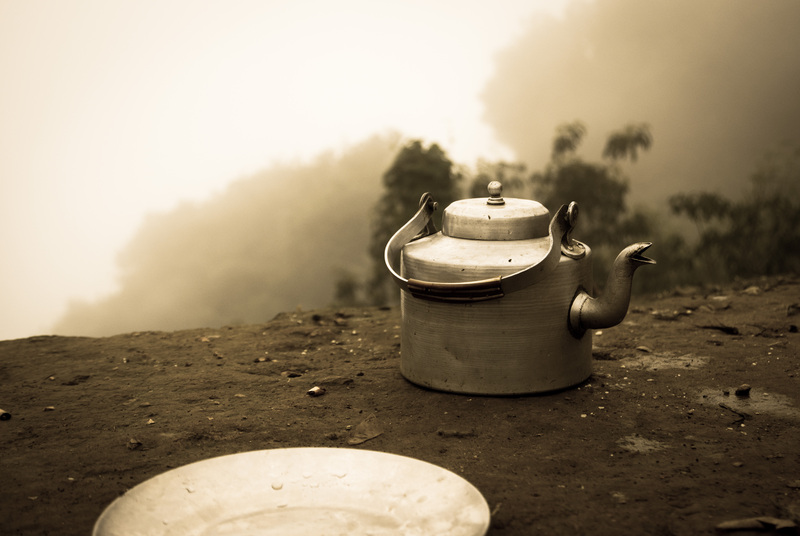 Brewing a perfect pot of tea was our secret pleasure, our first sip was conspiratorial, the second and third a signal to begin a conversation. In between tea times, we found ways to remember them to stay connected. On one of her travels, Denise bought me a tiny book with illustrations and instructions for each step. I would search Seattle’s bakeries and import shops for the most buttery shortbread to bring when we next visited. Her English upbringing meant she could out drink me, insisting that I drink one more cup, eat one more cookie. I’d always accept even though I was buzzing from caffeine and with trying to keep up my half of the conversation. On our way to a reading or concert, she would often offhandedly tell me about an insight she had after a dream, or after something she’d read, or seen, or sensed: a woman fishing on a pier who symbolized in her mind a historic era; a dream of her parents climbing the stairs; an intuition of the dead seeing through her eyes. Only later when I read poems based on these insights did I realize she had confided something of great importance to her. We were driving along a stretch of Lake Washington Boulevard which begins at Seward Park near her home and parallels a bicycle path for five miles. Century-old sycamores are all that separates the Boulevard from the bicycle path, and a row of aging cherry trees all that separates the path from the shore. The Boulevard is a legacy of the Olmstead Brother’s vision for Seattle of a series of greenways connecting all the city’s parks. Even if there were more direct ways to an event, Denise loved this circuitous route. She could see all the way across the lake and beyond to the Cascade Mountains, or peer closer to shore where flocks of coots and scaups bobbed on swells, and herons fished from harbor posts. At intervals we would pass fishing piers, city parks, marinas and swimming areas. On that day, we drove through heavy drizzle, the light damped, the mountains invisible. Denise turned to me and remarked, “I worry that William Carlos Williams would not like my recent poems.” “Why?” I asked. It is there, in the mouths of the living, that the language is changing and giving new means for expanded possibilities in literary expression and, I add, basic structure—the most important of all. Part of me lives under nettle-grown foundations. when something shall lift them and give them to deeper waters. Denise’s corner of the Northwest landscape—its mountain, lake, moon, sky, and animal life—were the perfect emblem for her pilgrimage’s end. It is as if her lifelong “fidelity to attention” had prepared a subject for her that made her spiritual questioning and poetic skill a complementary way of knowing. Throughout her life and work she was fascinated by, in Robert Duncan’s words, “the idea of poetic form as a way of ‘knowing’ the real. .. not only in order to participate in the universe but also to participate in self” (“Notes on Poetic Form”). If the landscape as a whole becomes a metaphorical space through which a poet-pilgrim journeys, then the Gray Heron is her companion along the way. Herons perched on posts or standing still in shore grass were common sights for Denise on her walks beside the Lake. She could train her gaze on them as fixedly as they could watch for luckless fish. A pair of heron poems (Heron I and Heron II) in Evening Train—their verisimilitude the envy of Northwest poets—illustrates how the analogies and symbolism of her mythmaking sometimes ruled a reader’s response rather than leaving it open-ended. when he will upon the fish. The particularity of the perception and its imagery fuses Christian mythology and the natural world into an archetypal image of spiritual hunger. The desire to experience the absolute—or timelessness—is inseparable from the act of seeking it (“Time does not pass, for him,”). Her portrayal of the spiritual immersion necessary for revelation—the striking of the fish that lies hidden beneath the surface of a still lake—can be read as a Christian symbol, and also as one that transcends it, arising as it does from its exacting likeness. The heron in its stillness becomes a resonant, irreducible presence, an animal spirit. One of them was Schneour Zalman, the founder of Habad Hasidism; the other, Angel Jones of Mold, a Welsh tailor whose apprentices came to learn Biblical interpretations from him while cutting and stitching. The presence in the imagination of such figures and their relation to oneself is a kind of personal mythology and can function as a source of confidence and as an inspiration for the artist; but I am unsure of whether, or how, it may acquire sufficient universality to affect others: perhaps by causing the reader to seek, and to recognize, parallels in his own background. Thus her experience of the all at the picnic becomes literally and figuratively the sacred space and time from which she sets out, an initiate with new spiritual and cultural knowledge to guide her: “What I desired / has always been to return.” In remembering this experience, Denise interestingly rejects her earlier conception of pilgrimage as “stages of a journey, moments of vision presaging the secret that will bring the seeker to his goal, but which are quickly forgotten again, or hidden again in the imagination … ” (“The Sense of “Pilgrimage”) . the autumn if its own brief bloom. I set the tray of tea and cookies on a coffee table within easy reach of Denise. Her sock monkey is propped on its pillow on a straight-backed chair. Behind me, bookshelves are crammed with contemporary novels, art books, books of essays, and with Chekov, Dickens and other literature from her childhood. Many more bookshelves filled with poetry are upstairs, closer to where she revises her poems’ drafts. In the past Denise has often jumped up, disappeared, and then returned with a book to make a point or share a passage. Now it takes a great effort for her to sit up. Later in this same poem, the moonlight’s glow becomes a path of “gold unalloyed” on the water, her observation sliding into a metaphor for spiritual seeking, one more example of how the city park and its harbor, its “woods, the lake, / the great-winged birds, the vast mountain at the horizon, / are Nature: metonymy of the spirit’s understanding (my emphasis) … ” (“Almost-Island”). She never names the elements of the Northwest landscape: Lake Washington is the lake, Mt. Rainier the mountain, Seward Park, her “almost-island.” Her erasure creates an idealized Platonic landscape, its elements becoming in her poems likenesses of the forms of ultimate reality, of the forms behind the forms. [pullquote]If “Nature” in her poetry is a metonymy for spiritual understanding, then “the mountain” stands for a divine presence hidden within, yet not of this material world—at least she investigates through her poems whether this is true. [/pullquote] She could see the mountain through her southern kitchen window and of course from many vantage points throughout the city. The mountain towers above it all, often hidden by Northwest weather, “a majestic presence become / one cloud among others, / humble vapor, barely discernible …” (“Effacement”). Each mountain poem takes its shape in an “unending ‘silent secret conversation'” that Denise holds with the mountain, a dialogue between her poet-pilgrim self and the divine, an exchange which is best characterized by Paul Celan: “Only in the space of this dialogue does that which is addressed take form and gather around the I who is addressing it.” In the mountain poems, she intensely focuses on directly grasping the mountain’s physical form so that she can make visible its invisible presence. slips by you with each recurrence. Appearing and disappearing, the massive mountain becomes fluid, a “sea-wave,” flowing in time as Denise’s perception of it flows in the poem, and yet its cadence is beyond measure. The poem’s artistry actualizes what cannot be known—that the mountain is inescapably physical and yet unfixed, an ever-changing and so non-existent essence. Emily Warn has published five collections of poetry, including three books: The Leaf Path (1982), The Novice Insomniac (1996), and Shadow Architect (2008), all from Copper Canyon Press, and two chapbooks: The Book of Esther (1986) and Highway Suite (1987). Her essays and poems appear widely, including in Poetry, Blackbird, Parabola, The Seattle Times, and many others.